Vine variety: 30 % Lagrein, 30 % Merlot, 30 % Cabernet Sauvignon, 5 % Cabernet Franc, 5 % Petit Verdot => this selection is a vintage cuvèe and contains about 10 % dried grapes (dried on the vine). 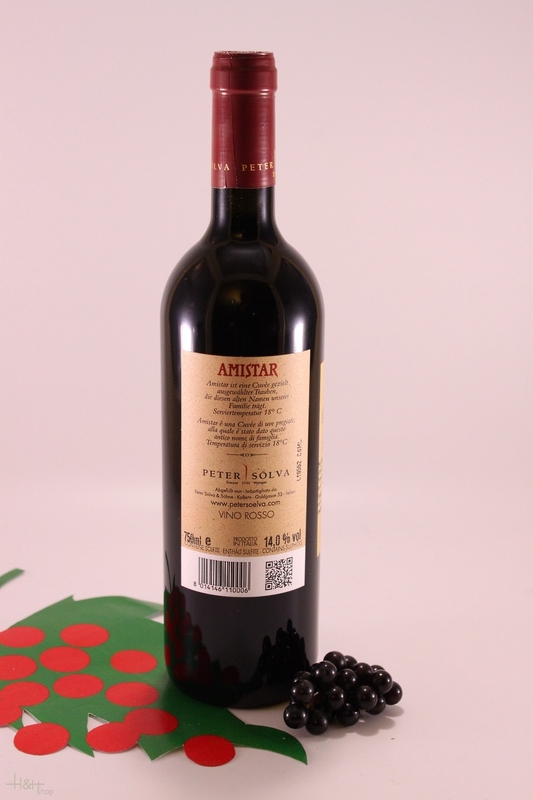 Description: This red wine cuvèe convinces by its versatility in aroma and palette. The aroma reminds one of forest fruits and dried plums and is lightly supported by wood. It is distinguished by its full and elegant palette and its balance. It is a complex red wine for discerning epicures. Land: The land goes loam to deep porphyry. Harvest:Various harvest times between the end of September and the beginning to middle of October (= dried grape harvest) because of the different locations. The Amistar concept requires a minimum of 19.0° KLM. Development: Mechanical removal of the stems, traditional mash fermentation in stainless steel tanks at controlled temperature. Juice extraction of about 30 % in order to obtain an extreme ratio between juice and skins. That is, more skins and much less must in order to guarantee an ideal maceration or extraction respectively for the Amistar concept. When fermentation is completed the wine is extracted the marc, all batches of each variety are then assembled in the available quantity parts of the vintage (no system assembly!!) and then stored in barrique casks for biological acid degradation for 1-2 years. Serving temperature: 18 °C recommendation > decanting. Food recommendation:This red wine cuvèe is suitable for discerning dishes such as grilled filet, ox cheeks, roasts in general, also to ripe hard cheese (recommendation: raw cow's milk cheese "Grotte") and particularly also for spicy dishes. We also recommend trying Amistar rosso with special dark chocolate.